Illness, disease, aging, physical or mental pain. For many of us this becomes our primary link to our spiritual journey. While many of us may be too busy worrying about our career, a new home, a new car, or other material ventures, an illness of some sort will inevitably touch your life and reshape your priorities. At times you will feel like you can lead the world, but inevitably a humbling event occurs. The most humbling events are the ones that threaten your health. A threat to my wife's health ultimately became our trigger to need to seek answers as to why? What's the purpose of suffering? Why should we exist to inevitably suffer in the end? Why is everyone else much happier, and prosperous? Why does this always happen to us? My Spouse for many years endured many mysterious and debilitating ailments. For my Spouse and I, the search for an explanation and cure of these ailments was the beginning of a journey to find the meaning to things that were making my life more miserable each day. Our search for a cure began with conventional Western Medicine. Western medicine views your well being as made up of good physical health and good mental health. Physicians and specialists prescribe drugs and perform surgery to counteract physical ailments. While psychiatrists and psychologists use drugs and/or discussion to control harmful thoughts and emotions. Western medicine does acknowledge additional uncontrollable factors like how your attitude and faith influence your recovery from an ailment. It's just that attitude and faith are never thought of as a primary source of healing. At best these things only help in how they may reduce any harmful emotional stress. But even emotional stress itself is largely thought of as mere chemical reactions that can be controlled most effectively with drugs. In conventional Western medicine you are considered a "Patient" more than a "Person." You are remembered mostly for your illnesses than for who you are. Here is where our journey took a turn into greater discontent. This was a journey through a set of medical rules and facts that just simply did not apply to Spouse and I. If the rules did apply our lives would be so much easier. After many years, we found only temporary answers and more questions rather than long lasting solutions. Her health would make a turn for the worse and the more inexplicable. We sought out alternatives to traditional Western Medicine. This began the journey through more and more "alternative" medical treatments. Alternative medicine is more and more being called Holistic Medicine. Holistic Medicine is about healing the total person. The philosophy is not simply to react to symptoms as they emerge, but to resolve the cause of the illness. A healthy person is viewed as a balance of Mental health, Physical health, and Spiritual health. Although Spiritual health is now being embraced, for the most part it is still considered secondary to mental or physical solutions. Spiritual healing is mostly considered a religious issue. However, as I'll describe in Search for Spirit Spirituality and Religion are different. For those of you interested in a balanced Holistic Medical approach to your health, the above pie chart illustrates what are widely accepted approaches to being a balanced healthy person. However, most "alternative" medical therapies don't fall cleanly into something that addresses just your body, mind or spirit. Usually, each therapy overlaps in all three regions. The differences are only in that some modalities may be emphasized more than others. Probably a better way to organize the different kinds of therapies in Holistic Medicine is to view the treatments in three modalities of treatment: Physical, Mental, and Bio-Energetic. The initial instinct is then to say that Bio-Energetic treatment is the same as Spiritual. If you read the section on Spirit you see why this doesn't work. Of all the forms of "alternative" medical treatments, energy healing appealed to us the most. For those who explore acupuncture or yoga you will often hear the human life energy force being called the "chi" or the "prana." The root cause of all physical and mental illnesses come from an imbalance or a blockage in the flow of the "chi" or "prana." All bio-energetic healing seeks to release blockages and achieve balance. Once balance is achieved physical and mental healing occurs. Because the results often defy the logic of Western Medicine the healing often appears miraculous. Which for skeptics means that the healing or the illness was imaginary. For skeptics this energy field does not exist and was just a primitive view of health that was created thousands of years ago because of ignorance. However, this energy field is the basis of acupuncture. And today acupuncturists are widely accepted as a form of therapy on which you can get medical insurance coverage. Therefore if Western Medicine accepts acupuncture, how can it not accept the existence of this bio-energy field? Modern Western medicine tends to think of acupuncture as working by triggering nerves to release painkillers and not this abstract view of energy meridians. Therefore, despite it's acceptance much of the theory of acupuncture is still not taken seriously. There are many other energy healers that work similarly to acupuncture but work with subtle hand contact and sometimes no physical contact. In these areas the acceptance is very mixed. For the most part the philosophy is if you don't understand it, it doesn't exist. However even it doesn't exist, as long as it doesn't make things worse, and there seems no other solution, then it's at least worth a try. As far back as 5,000 B.C. there is written record of the concept of a bio-energy field that surrounds every living creature. This energy life force field provides a template upon which the physical cells grow. A disorder in the energy template will be followed by a disorder in the physical cells. However, for us and anyone growing discontent with the lack of satisfying relief offered by Western medicine, this concept of healing our energetic fields offers some very real and effective answers. By visiting various energy "healers" in the art of balancing the human bio-energetic fields my spouse was definitely able to get significant relief. A very common view of the energy field involves 7 chakras. There are those who say there 8 or more chakras and different dimensions and layers of chakras. However, everyone does tend to agree on these 7 major chakras. A chakra is considered an energy center. For energy healers who have learned to sense and see these chakras, they appear like vortices of energy. In fact the word "chakra" is the Sanskrit word for "wheel". 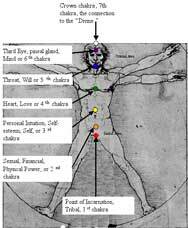 In the above diagram of a human body you see the arrows pointing to the 7 major chakras. The bottom or 1st chakra deals with the customs, rules and tradition you grow into and accept. The 2nd chakra deals with your sexuality and power and any blockages here will translate into things like lower back pain, and diseases of the colon, prostrate, and ovaries. The 3rd chakra lies above your naval and deals with your sense of self, your self-esteem and intuition. Any disorders here will translate into you feeling insecure, feeling stomach disorders, lower back pain or other ailments in the mid-section of your body. The 4th chakra deals with love. A disorder here would translate into heart and chest related problems. The 5th chakra lies in the upper throat region and deals with your will to speak the truth. A disorder here translates into throat and mouth problems. The 6th chakra or the 3rd eye has to do your ability to think and see. A disorder here would translate into self-harming attitudes, concepts, and physical disorders in the brain. Finally the 7th chakra lies at the top of your head and is related to your connection to the divine. A disorder here translates into a loss of a greater purpose and a spiritual disconnect. Based upon this one might think that healing the energy is the cure to everything. The stories of "faith healing" or miracles being performed by saints could be viewed as energetic healing. In fact the energetic domain at first seemed to be the one view that could integrate tangible things like brain, body and heart with intangible things like mind, emotion, love, spirit and soul. The chakra system invites you to physically place and locate on your body where your mind, emotion, love, spirit and soul reside. But in the end despite the dramatic experiences with energy healers we had, my Spouse still never found solid and lasting relief from her physical ailments. I continued to fall into frustration and disillusionment. I can always remember my Spouse stressing the need to find the root cause. We explored all modalities, mind, body, energy and spirit but none seemed like the root cause. Was there yet another modality? What was the root cause? Click Here for more.